Home / rocking out / Rocks by Sekou rocks MSNBC! Rocks by Sekou just made its national television debut! Harriette Cole, TV personality and founder of DreamLeapers, was asked to appear on MSNBC this morning to comment on the untimely demise of Prince. 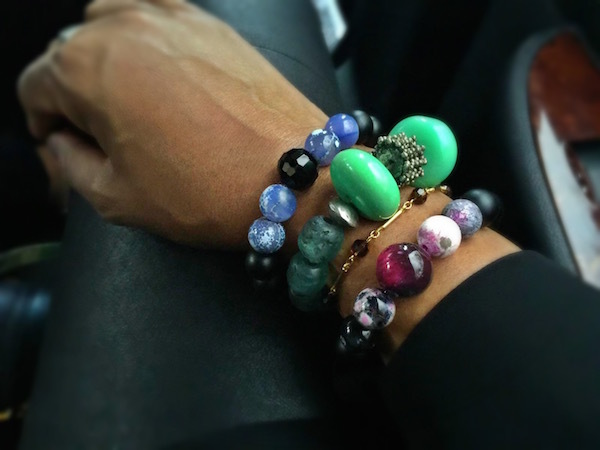 During her segment, she happened to be wearing not one, but two different Rocks by Sekou bracelets! On her right wrist, Harriette was rocking an Enhle Truth In Reality bracelet that generates funds and awareness for the Truth In Reality nonprofit created by Sil Lai Abrams. Harriette was also wearing a blue and black custom gemstone bracelet created just for her by yours truly. Speaking of Prince, at the suggestion of a friend I’ve created a very limited run of Purple Rain bracelets, in honor of Mr. Purple Rain himself. Check them out! And be sure to check out Harriette Cole talk about her friendship with Prince, below!